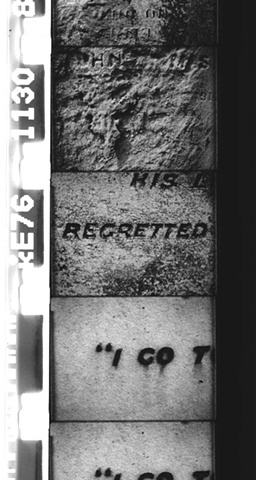 For Text & Context, Jim Hobbs has created ALSO, a silent 16mm film which focuses on the physicality and tone of language created with/within spaces reserved for those whom we memorialize. Shot frame by frame in 7 cemeteries across Cambridge and London, and in collaboration with Cambridge-based lettering artist/stone carver Eric Marland, the work presents an overwhelming montage of words and images that examine the particularities of this type of language. The film will be situated within The Punter, a local pub in the shadow of St Peters churchyard, where the work acts as a reminder of the complex relationship between the celebratory nature of life and the desire/need to memorialize the past.